Applying well-known design: The GM4-D design is based on the experiences of the previous 4 harsh-environment semi-submersible drilling rigs built at CIMC Raffles. It has been prepared for the future requirements of the largest client in Norway, Statoil (CAT-D) – Ready for completion/intervention work. Covering 95% of all work in Norway: The rigs are designed to operate at water depth up to 1200m (drill to 8000m) in air temperature of -25°C to meet the Ice-T class. Ready for new areas: The rigs are capable of harsh weather conditions and winterized for operation in Arctic areas like Barents Sea (Northern Norway). There is sufficient variable deck load capacity to operate efficiently with Arctic/remote area logistics. Efficient operational layout and newest drilling technology and flexible positioning: The rig layout is optimal for safety and operations. It will drill efficiently on the NCS. High capacity power generation supports demanding operations, while DP3 and thruster assist 8-point mooring system allows for cost-efficient positioning and quick mobility. 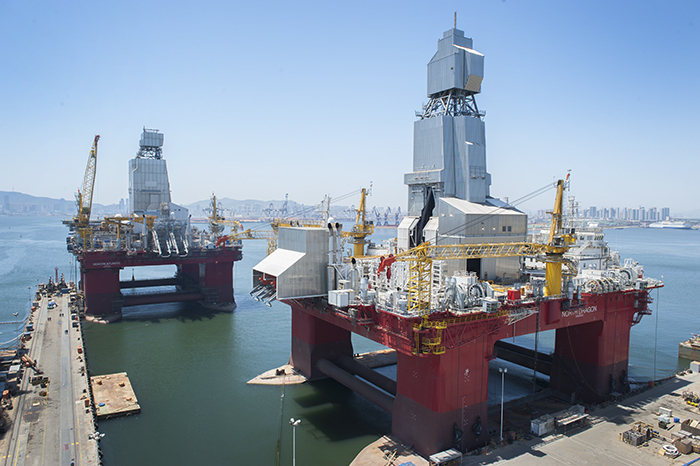 Fulfilling stringent regulatory requirements: The rigs fulfills the requirements of NMD, NORSOK and NPD Standards and classed by DNV Zero discharge /environmentally friendly.